The word Guru refers to one who dispels the darkness of spiritual ignorance in several world religions such as Hinduism, Buddhism, Sikhism, and Jainism. Guru is a word originally derived from two syllables of Sanskrit script referenced in Verse 16 of the Hindu scripture Advayataraka Upanishad. Together the two syllables form the word Guru, meaning one who dispels the darkness. The Sikh definition of Guru is enlightener, or liberator, a spiritual guide. The guru offers salvation and gives spiritual guidance illuminating the path of the soul through darkness into light. In Sikhism, beginning in the year 1469 A.D. with First Guru Nanak Dev, a succession of ten gurus each embodied jot, or the light of spiritual illumination. The jot passed from each guru to his successor. On October 7, 1708 A.D., the status of Enlightener ultimately was bequeathed by the Tenth Guru Gobind Singh to the sacred scripture ​Siri Guru Granth Sahib and named the sole and everlasting guru of the Sikhs. In the religion of Sikhism, each and every Sikh is considered to be a spiritual seeker only. The word guru is a component of many Sikh spiritual names beginning with g, but that in no way designates a person bearing such a name to be guru. 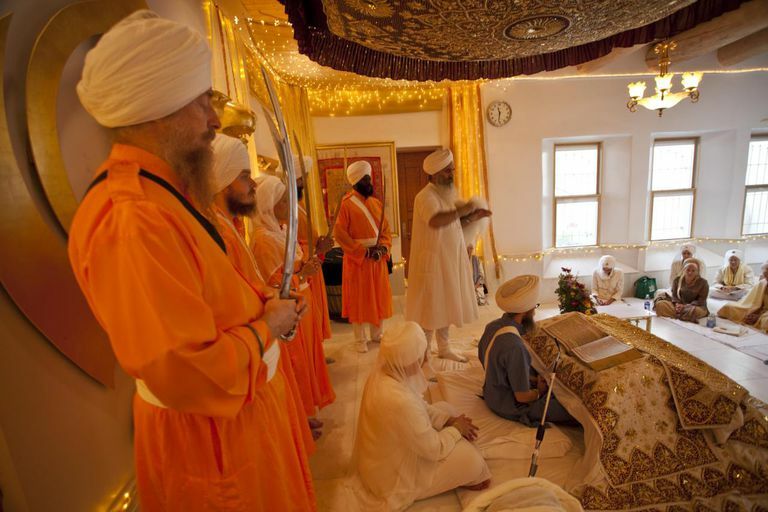 All Sikhs are regarded merely as disciples of Siri Guru Granth Sahib. No mortal person may dare to assume the title or status of guru, for to do so is considered the ultimate blasphemy. The scripture of Siri Guru Granth Sahib provides divine instruction as a guide to dispel the effects of spiritual ignorance and illuminate the darkness of ego which shrouds the soul keeping it in a state of duality. The illumined soul guided by the guru's instruction comes to realize that it is one with Ik Onkar the creator and all of creation. The Sikhs method for realization is to recite Waheguru, their name for the ultimate supreme divine wondrous enlightener. The pronunciation and spell of the word "guru" and its derivatives is a phonetic rendering of Gurmukhi to English. Guru: The two syllables of gu-ru are pronounced differently. The first syllable is phonetically written as gu, the u has a similar sound to the oo in the word good. The second syllable is phonetically written as roo and has the sound of ou as in you. Gur: The gu in gur sounds like err, so that gur sounds like grr. Gu(i)r: The i is a Gurmukhi sihari and is a short vowel and silent or barely inflected following gur. Gur or Gu(i)r; Modifications of guru appear countless times in Sikh scripture. Generally, gur means spiritual teacher, while gu(i)r spelled with sihari is a grammar usage. These examples from the scripture of Siri Guru Granth Sahib explain the concept of Guru in Sikhism. What Is the Meaning of Sikhism Term Waheguru?